And when outside everything is grey, orange CAN save you! Orange can make you happy! Then you open the pressure cooker you had used to cook everything, and you see everything orange, because the steam just burnt your finger! And life is less nice then before, but, you know, you still have your orange (f#@§%&*) soup to relay on! Aw Sara, I’m so sorry about your burn! The sacrifices you make for your blog readership! I have been meaning to try a carrot soup and may have to give your recipe a try. It sounds easy and good for a cold night. Hope your hand heals quickly. Don’t worry too much about your burn, eventually you will burn those finger tips right off and you won’t be able to feel it anymore, trust me I have experience! Plus, this picture is totally worth it. 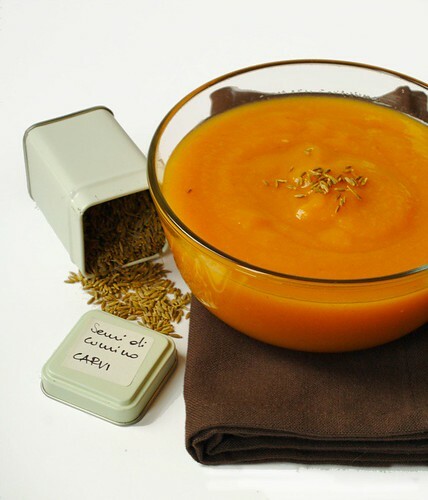 I love carrot soup, I made a version recently with cashews that was really yummy. I think this will be my next soup. Is carvi the same as cumin, BTW? I love this recipe! I am going to try it tomorrow! As I said in my blog, I sauteed some – maybe you care to try my recipe too. But still had several left and I was browsing the web in search of the tempting one. Thank you!